Here is how 2018 strikeout (K) leaders fared in Box-Toppers points. Players are ranked by strikeouts. Also shown are their 2018 Box-Toppers points (BTP) and their rank in Box-Toppers points among all players. Interestingly, Box-Toppers top-ranked player for 2018, Rays pitcher Blake Snell, is not among the top 10 season strikeout leaders. Snell, who led players with 27.2 Box-Toppers points, ranked just outside the top 10, tied for 11th place with 221 strikeouts, just one behind 10th place Corey Kluber of the Indians (222). Scherzer led with 300 strikeouts in 2018. He had 25.1 Box-Toppers points, first among National League players and second among all players, just behind Snell. Astros pitcher Justin Verlander led American League players in strikeouts with 290, second among all pitchers. He ranked third among all players in Box-Toppers points with 24.1, second among AL players, behind Snell. Gerrit Cole, Astros, third in strikeouts (276) and eighth in Box-Toppers points (18.0), sixth among AL pitchers. Chris Sale, Red Sox, sixth in strikeouts (237) and sixth in Box-Toppers points (20.1), fourth among AL pitchers. Carlos Carrasco, Indians, seventh in strikeouts (231) and seventh in Box-Toppers points (19.1), fifth among AL pitchers. Aaron Nola, Phillies, ninth in strikeouts (224) and fifth in Box-Toppers points (21.1), second among NL pitchers. Corey Kluber, Indians, 10th in strikeouts (222) and fourth in Box-Toppers points (21.7), third among AL pitchers. Jose Berrios of the Twins, who ranks ninth in Box-Toppers points with 17.8, seventh among AL pitchers. Berrios ranks 16th with 202 strikeouts. Luis Severino of the Yankees, who ranks 10th in Box-Toppers points with 17.7, eighth among AL pitchers. Severino ranks 13th with 220 strikeouts. 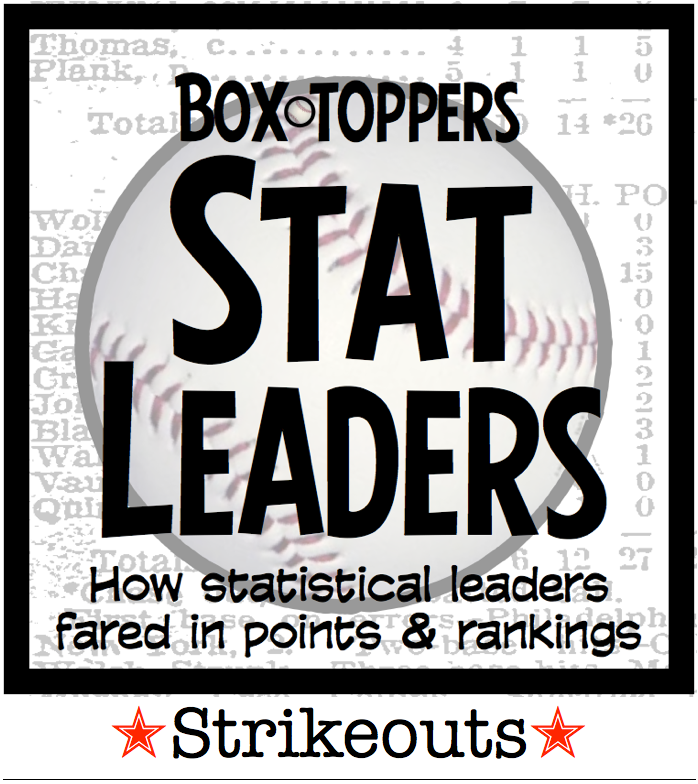 Rockies pitcher German Marquez ranks lowest in Box-Toppers points among the top 10 season strikeout leaders. Marquez, who ranks eighth in strikeouts with 230, ranks 17th in Box-Toppers points with 14.7, sixth among NL pitchers. Jacob deGrom, Mets, who ranks fourth in strikeouts (269) and 12th in Box-Toppers points (16.8), third among NL pitchers. Patrick Corbin, Diamondbacks, who ranks fifth in strikeouts (246) and 13th in Box-Toppers points (16.0), fourth among NL pitchers.